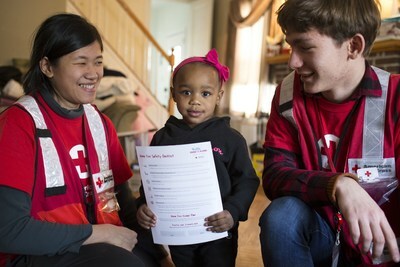 WASHINGTON, May 23, 2018 /PRNewswire-USNewswire/ -- Over the course of just a few weeks in April and May, more than 30,900 volunteers and thousands of partners from across the country joined the American Red Cross to Sound the Alarm against home fires by installing 103,400 free smoke alarms in communities at high risk for fires. "We are so grateful for everyone who contributed to the success of this inaugural lifesaving effort," said Gail McGovern, President and CEO of the Red Cross. "With the help of our volunteers, partners and donors, we surpassed even our own highest expectations by making 43,000 homes safer across 120 major cities in the United States." Every day, seven people are killed and another 36 are injured because of home fires. Tragically, most of these deaths occur in homes that don't have working smoke alarms. Sound the Alarm is part of the multi-year Red Cross Home Fire Campaign, launched in 2014 to reduce the number of home fire deaths and injuries in this country by 25 percent. 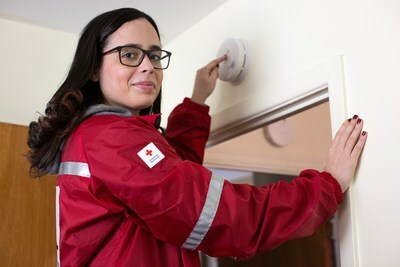 Since 2014, Red Cross volunteers and partners have installed more than 1.2 million smoke alarms and reached more than a million children through preparedness programs. "Our Home Fire Campaign is already credited with helping to save 431 lives," McGovern reported. "And this is just the beginning. We will build on our collective success and continue to reach more families and communities with lifesaving preparedness information in the months and years ahead." Practice fire drills at home. Fire experts agree that people may have as little as two minutes to escape a burning home and the Red Cross urges every household to create a fire escape plan and practice it until everyone can escape in less than two minutes. Check smoke alarms monthly. Working smoke alarms cut the risk of dying in a home fire in half. Place smoke alarms on every level of your home, including inside and outside bedrooms. Test smoke alarms once a month. Change the batteries at least once a year, if your model requires it.